Tim Schafer is widely known as one the best creative minds in the indie market, a reputation he has carved out of such classics as Grim Fandango, Psychonauts, and myriad other games since the launch of his own company. However, like most artists, the man is not a businessman, and he often lets his crazy imagination run away with budgets. Stories arose about problems with Brutal Legend back when Activision was publisher, and it seems to have caught up with Double Fine again. The problem this time is that this is Kickstarter money from the fans, the very people he wants to make happy. His massively successful Kickstarter campaign for Broken Age, which set records of $3 million earned at the time, is on the path to lose all of its money as Schafer explains in an update to Backers that has spread like wildfire. "Even though we received much more money from our Kickstarter than we, or anybody anticipated, that didn't stop me from getting excited and designing a game so big that it would need even more money." Behold the dangers of Kickstarter, I suppose. if such a high profile failure were to occur, I doubt the site would remain as popular as it is today. Tim Schafer is not about to let that happen as he is looking for funds through other means. 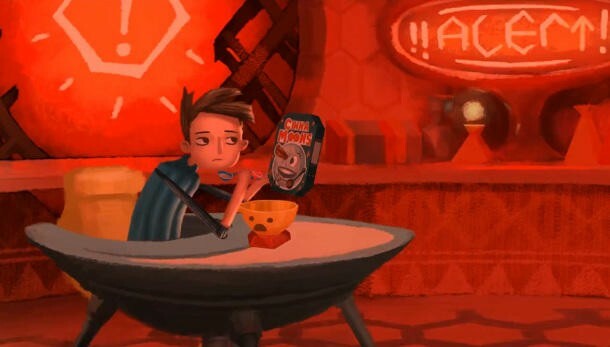 Instead of a new Kickstarter, Double Fine will turn to Steam Early Access. This will allow them to release Act 1 of the game next January, earlier than the projected July release, and give it the funds to finish the second half. Small cuts will have to be made, but it's a much smaller loss than the 75% cuts he will have to make if development carries into 2015. "Going back to Kickstarter for it seemed wrong. Clearly, any overages were going to have to be paid by Double Fine, with our own money from the sales of our other games. That actually makes a lot of sense and we feel good about it. We have been making more money since we began self-publishing our games, but unfortunately it still would not be enough. Then we had a strange idea. What if we made some modest cuts in order to finish the first half of the game by January instead of July, and then released that finished, polished half of the game on Steam Early Access? Backers would still have the option of not looking at it, of course, but those who were sick of waiting wouldn't have to wait any more. They could play the first half of the game in January!" How a $400,000 conceived idea is putting the sweat on a company who was able to rake in $3 million and turn it into a massive project is beyond me, but hopefully Double Fine will be able to avoid the whole mess and put the game out sooner than later. The Steam Early Drive is set to begin in January, so keep your eyes peeled for an early look into the game, and also be sure to keep it funded.